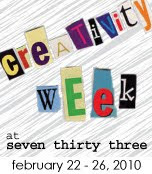 Craft Envy: Creativity Week at 733! I am so excited to let everyone know about our very first guest posting opportunity! Kim at 733 is having this awesome Creativity Week, and yours truly have been invited to guest post. You should be seeing us tomorrow at 733, so please run over to check it out! Kim has had some wonderful things to share this week, I know you'll love it. And don't forget to be a part of our GIVEAWAY!!! You know you want one of those gorgeous tie headbands that Nicholette has made, so don't miss out!